When I was living in Los Angeles, I use to frequent this tiny hole-in-the-wall restaurant where they served the most amazing vegetable lo mein. I have yet to find a place here in New York City that serves up lo mein that gets me as excited. 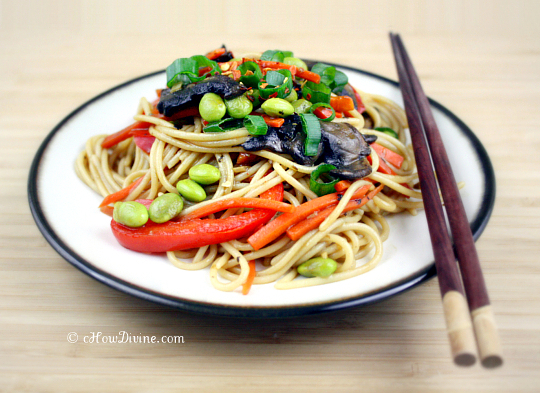 I love the flexibility of a homemade lo mein. It’s quite easy actually. You can use whatever proteins or veggies you have on hand. It’s a nice way to use up your veggies and tidy up your refrigerator in the process. Go ahead, use up the carrots or broccoli that’s been sitting in the refrigerator for a week! You know they will go bad in a few days. If you have any chicken left over from last night’s dinner, chop it up and throw it in. You have tofu? Cut it into cubes. Pan-fry or saute them and throw them in. Even the sauce is adaptable. It’s so tasty and so much healthier than the – often greasy – restaurant version. And it’s super easy to make. *Note: This is an adaptable recipe. If you do not have hoisin sauce, just replace it with oyster sauce or just increase the amount of soy sauce. However, add a little bit of starch (potato or corn) and some sweetener (agave nectar or sugar) if you are using only soy sauce. And of course, you can use other types of pasta – especially if you are not gluten-sensitive. Cook pasta/noodles according to package directions. While the water is boiling/pasta is cooking, heat pan on medium-high heat. Add 1/2 of garlic and white part of scallion to oiled pan. Let it heat until fragrant, but don’t let it burn. Add sliced mushrooms. Sauté mushrooms on high heat. Once lightly browned, add pinch of salt and 1 tsp soy sauce. Mix well. Set aside. Wipe down pan if necessary. Heat pan on medium-high heat. Add rest of garlic & white part of scallion on oiled pan. Allow it to become fragrant. Add carrots. Sauté for about a minute. 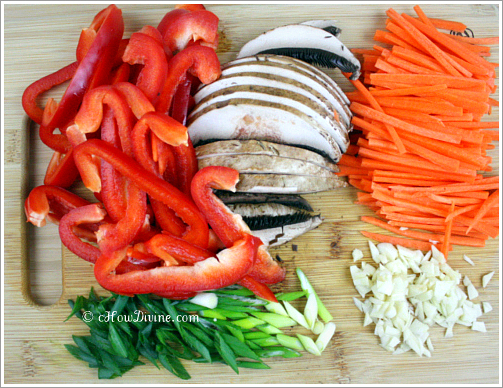 Add red bell pepper to pan, sauté until crisp tender – for about 2 minutes longer. 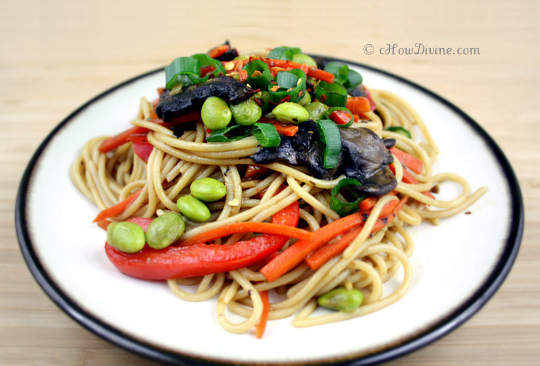 Add back mushrooms and edamame. Mix well. Allow the mixture to heat through. Add cooked pasta. Stir until well combined. Combine hoisin, tamari, and sesame oil. Add to pan. Stir until heated through. Add green parts of scallion at the last minute and stir well. Add salt and pepper to taste. Serve. Looks yummy, this has all my fave foods including edamame. Same here Erin! I’m attempting to crochet my first doily. I figure that would be the easiest thing to attempt for a first-timer? I must learn to crochet/knit from you! The first thing I crocheted was a doily for home economics class back in school. Have you found a pattern? I like Japanese patterns which are in the form of a chart, it seems easier to follow than a pattern written out in words. By the way, I read in your “About Me” that you are an attorney 🙂 We have something in common – I am a lawyer turned academic teaching business law in university. Do feel free to email me if you need any help with crochet. Thanks Erin! I remember my mom finishing one of these in one sitting. Not me tho. It may take me a year to finish it. Btw, you must be a BUSY woman. I can hardly find the time to do anything; and we don’t even have kids!